Looking at unborn fetus at St Bart’s Pathology Museum, where some of Hunter’s specimens are kept. Standing in the middle of the Crystal Gallery in the Hunterian Museum at the Royal College of Surgeons, my mind begins to wander to the hundreds of lives contained in these glass jars and to the man who dissected their bodies. John Hunter. His name seems acutely appropriate, for he was a hunter of sorts: a hunter of truth, a hunter of death, a hunter of bodies. Here was a man who had no qualms about assisting the body-snatchers on their midnight soirées through the cemeteries of London; a man who relished in the sights, sounds and smells of the dead house. Hunter was as tenacious as his name suggested. He was not one to shy away from a challenge, and he never gave up. 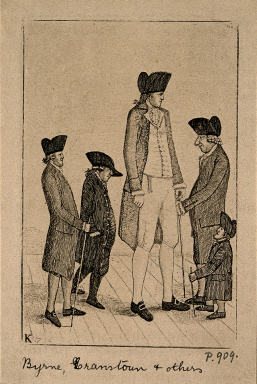 When Charles Byrne, the Irish Giant (right), made explicit demands that his 7’7’’ frame be buried at sea so as to prevent the insatiable anatomist from obtaining his corpse, Hunter out-manoeuvred him by bribing one of Byrne’s friends to hand over the body for an exuberant sum of over £500. Acutely aware of how his actions might be perceived by the public, Hunter swiftly chopped the body into pieces and boiled the flesh off the bones. The dead had no rights in Hunter’s world. And so, standing amongst the rows and rows of pickled specimens and skeletal remains—one of which belongs to none-other-than Charles Byrne—I wondered: what happened to the body of John Hunter, the man behind all these broken hearts, gutted intestines, bloated appendages and pregnant wombs? Hunter died on Wednesday, October 16th, 1793. 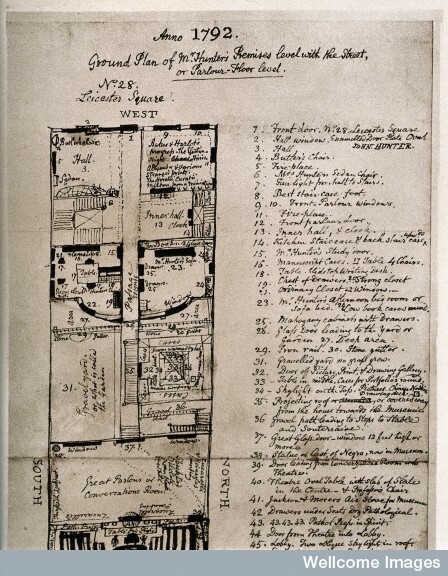 He had started his day off as usual, helping pupils in the early hours of the morning with their anatomical preparations in the dissection room attached to his house at 28 Leicester Square (see floor plans left). He was reportedly in a jovial mood, ‘humming a Scotch air’ and joking with the students. At noon, Hunter headed off to St George’s Hospital to attend to his patients. But first, he had urgent matters to discuss with hospital staff. And so Hunter set out to press the two young men’s case before the hospital committee. Tensions had always run high amongst him and those in attendance. When the subject of the two Scottish youths finally came up, Hunter was immediately contradicted. He became irate and ‘lashed back in fury.’  Then, in the midst of the argument, the old surgeon suddenly stopped talking, and fell into the arms of one of the physicians standing nearby. His death came as a shock to all except possibly himself. Hunter had long been suffering from angina and remarked a few days earlier: ‘One of these days, and not long first, you will hear that I have dropped down dead’. 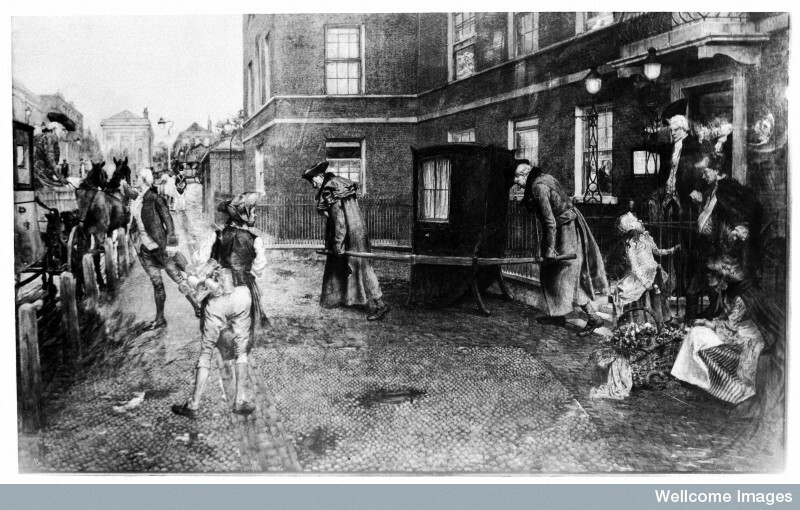 His body was taken back to 28 Leicester Square in a sedan chair (right) and laid out on a table in his own dissection room. The duty of performing the autopsy fell to Hunter’s nephew, Matthew Baillie. With his pupils gathered around his body, Hunter became the focus of one final lesson. Those who attended were able to confirm that the 65-year-old surgeon had indeed died from what he suspected would kill him in the end: angina brought on by a hardening of the coronary arteries. Unfortunately, his fellow anatomists did not acquiesce to his final demands. Hunter’s body remained intact, and on October 22nd, he was afforded the burial that he had denied so many others. Ironically, Hunter would have been just as unhappy with this outcome as Charles Byrne most certainly would have been with his own untimely end. The Hunterian Museum, London. Charles Byrne’s skeleton can be seen in the back. 1. Wendy Moore, The Knife Man: Blood, Body Snatching and The Birth of Modern Surgery (2005), p. 267. 4. Jessie Dobson, John Hunter (1969), p. 344. Qtd. in Moore, The Knife Man, p. 268. 5. Moore, The Knife Man, p. 270. Thanks very much for your kind words, and for following the website! Thanks Maureen! Looking forward to seeing you again as well! John Hunter’s death may well have been due to his accidentally infecting himself with syphilis and gonorrhea. He inoculated himself with infectious tissue to prove that they were both the same disease and should be treated the same way (they aren’t and they shouldn’t). His medical experimentation likely hastened his death. Hi Lindsey, Brandy Chilliance recommended your site and I’m completely hooked. My next novel “The Dead Shall Not Rest” has, at its core, the Hunter /Byrne chase, and it’s a story that has captivated me for years. Wow – thanks! What an honour to have you following my website. I’m off to France on Wednesday and was just downloading The Anatomist’s Apprentice to my kindle for some holiday reading 🙂 Would love to interview you for the site about your upcoming novel! I’d also love to get your insights into what it’s like breaking into fiction as I am very interested in doing this myself. I do apologise for only just seeing your reply. It would be wonderful if we could chat about my second novel. It’s out on December 24, so perhaps we could fix something in the next few weeks? I’d love to hear about your work, too. Brilliant post! Thanks Lindsey, I really enjoyed this and will definitely be looking out for more from you. Than you for the great post.